This is most distressing to me as an American Muslim. Houses of worship are sacred spaces, places of peace and tranquility, and they must be off limits for any savage seeking to do harm to either the building, the inhabitants inside, or both. The attacks on the mosques in Christchurch New Zealand really hit home for me. I saw myself in any one of those victims, who were savagely gunned down in their house of worship on the holiest day of the week. And: I also see myself in the victims of the Emmanuel AME church shooting; and the Pittsburgh synagogue shooting; and the shooting in the church in Texas. Those black churches in Louisiana are my houses of worship as well, even though I do not practice the Christian faith. Our churches are sacred, central parts of our communities and everyone should feel safe in their place of worship. 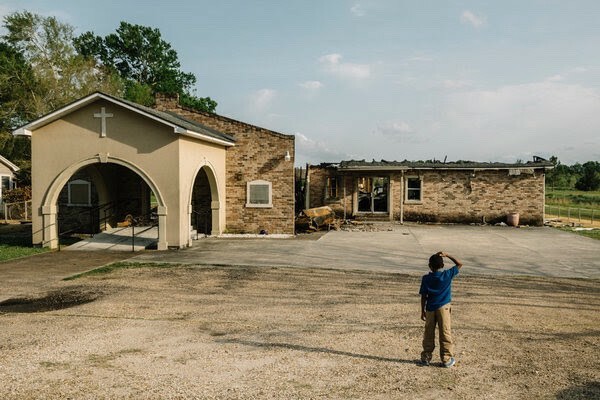 We do not know the cause of these fires in St. Landry and Caddo parishes, but my heart goes out to each of the congregations and all of those who call these churches home. It is mind boggling to me that, in 2019, black churches are still being burned to the ground. How can this be, America? Houses of worship must be off limits; houses of worship must be a red line that no one of any human decency should cross; houses of worship must be places wherein “God’s name is mentioned much,” as the Quran says, and the people mentioning God’s name therein are safe and sound from massacre. My heart and prayers go out to the congregations affected by these church burnings. I pray that those behind these acts of terrorism be found and brought to justice. And I pray that, forever and ever, our houses of worship remain palaces of peace, safety, and security. Amen.